Decorating a Christmas stocking can be a fun project for the entire family. In fact, you don't need to make a stocking from scratch to be able to personalize it. Many store-bought stockings can be upgraded with embellishments that tie into your style. These stocking decorating ideas range from easy to complex and are guaranteed to become a focal point of your holiday decorations. Whether you enhance your existing stockings or purchase new ones is up to you. Most people make personalized Christmas stockings by writing the name of each family member on the rim of the stocking. Make that concept more visual by adding individual photographs of your family members instead. The overall look is more unified when you treat each photo with the same filter, which in this case is a black and white overlay. There are a ton of Christmas stocking decorating ideas geared toward children, but this is one of the more charming ones. Cut out or purchase felt shapes that are holiday inspired. Lay them all out and let your children glue them onto their stocking. If you want to make your stockings appear more rustic, add customized name tags using wood slices. All you need to do is drill a hole into the wood slice and add on a name using a felt tip pen. If your handwriting is not very good, consider using vinyl lettering instead. One very simple way to decorate Christmas stockings is to tie on two very large white pom-poms to the hook. This idea works well if the rest of the stocking is simple. Just make sure that you let one pom-pom hang a little bit longer than the other. 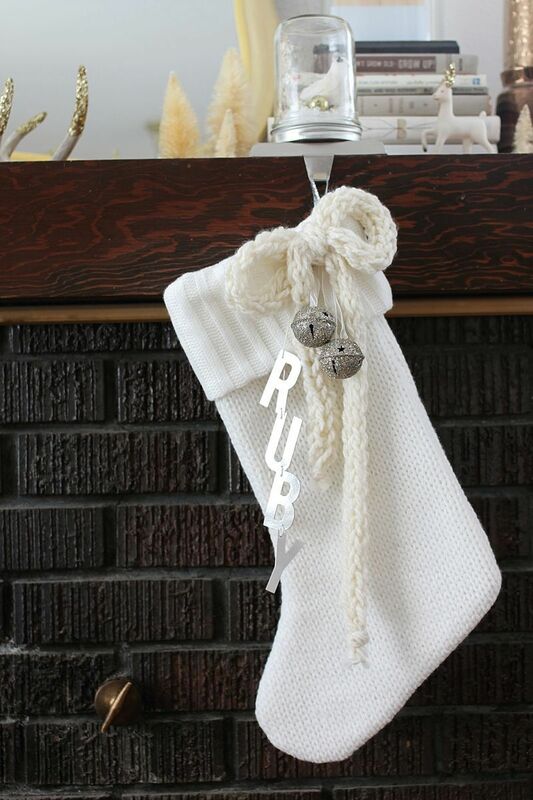 This Christmas stocking idea utilizes holiday embellishments you might have around the house. Did your grandmother leave you with some festive holiday brooches? Use those in the upper right-hand corner. Finish the stocking off with a hand stamped name tag. Instead of embroidering on or adhering an initial to a stocking, consider using a pin. This way you aren't committed to one design that could go out of style. You can easily change out stockings or styles as the years go on. Elegant Christmas stockings are usually pretty simple. They come in luxurious fabrics that have soft textures and are generally neutral toned. What makes these stockings more elegant is their stuffing. Consider adding glittery painted pine cones inside a sweater stocking to recreate this look. This stocking decorating idea is both festive and elegant. Pair glittery jingle bells with silver lettering that is woven into a name with a piece of yarn. The final touch is a knotted yarn bow that matches the stocking. If you want to add a name tag that will withstand many years of being stuffed inside a holiday tote, consider using luggage tags. A soft brown leather luggage tag will bring a rustic element to your stocking. Print off names on a yellow toned paper so the tags look vintage. If you have stockings you don't want to change, consider switching up what you put inside the top of the stocking. To add a farmhouse element to your stocking set up, stuff the inside with faux green boxwood along with gold and silver ball ornaments. For a whimsical boho stocking, embellish the exterior with a variety of different colored pom-poms. Instead of choosing every possible color, try to stick to between 3-6 colors all within the same tone. For instance, you might choose pastels or you might choose jewel tones. One classic way to decorate a stocking is by embroidering names on the rim. Practice your font style on a scrap piece of felt so you know what the end result will look like. We like how this crafter matched the thread to one of the pom-pom accents. In most cases, a burlap-toned fabric stocking might be considered rustic or farmhouse. In this case, the combination of leather and a drop cloth creates a very modern bohemian vibe. The easiest shape to cut out of leather would be these Christmas trees, but you can experiment with other seasonal shapes like snowflakes or candy canes. Trim your stocking the old fashioned way using rickrack ribbon and pom-pom trim. This idea is a fun one to take on with kids. However, if you want the stocking to look crafty yet elegant, follow the exact template you see here. Don't overthink stocking decorating. In many instances, editing down your decorating is a good idea. Sometimes the simplest touches will make the biggest impact. All this crafter did to elevate her stockings was clip on small evergreen branches using clothespins. The plain stocking is decorated with a simple farmhouse stamp and cursive name that are both meant to look faded.